Bible stories we’ve read before, biblical characters we’ve met before, but never this way. 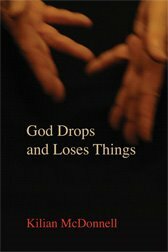 That’s what fills the pages of Benedictine Father Kilian McDonnell’s third book of poetry (St. John’s University Press). Perhaps you — like myself — feel you are out of your area of expertise in reading, no less reviewing, poetry. But take a chance, challenge yourself and try to see with the eyes of this monk from St. John’s Abbey in Collegeville, Minn. I stuck a Post-It note on at least a dozen of the nearly 50 works because they said something to me. For one thing, Killian gives a voice to the women of Holy Scripture — Miriam, for example, and Mary Magdalene — whose thoughts the Bible authors mainly ignored. See how quickly you find the “prodigal daughter” entry. Moving from the Hebrew Testament to the New Testament, Father Kilian re-writes parables with a new, imagined tone that somehow makes the stories of Jesus mean more to today’s hearer. I loved “The Catholic Thing,” an accusation in poetic form that correctly charges us Christians with being so unchristian at times.